Drug Plan Doesn't Speak Their Language: Seniors with limited English skills are having a hard time accessing Medicare's new prescription program. More than a month had gone by, and 81-year-old Lee Sun Hua still didn't have his medication. In January, a pharmacist had refused to give the Koreatown resident his drugs, erroneously telling Lee he needed his new Medicare drug prescription card. He waited for weeks, and even had a volunteer at a Koreatown nonprofit agency call to request it. But it never came. Bothered by a chronic stomach ailment, Lee called his Medicare drug plan provider, Blue Cross, two weeks ago to inquire again. "I don't speak English," he said, reading from a tip sheet prepared by the nonprofit, which spelled out the pronunciation of English phrases using Korean syllables. "Korean, please." "We don't have any Korean speakers here," came the blunt response, as Lee recalled the conversation. "Does anyone over there speak English?" 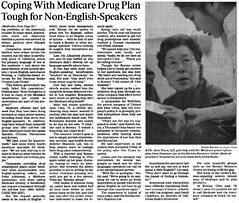 If native English speakers are having trouble grasping the new Medicare prescription drug plan, many immigrants with little or no English ability are far worse off. As the May 15 deadline for picking a plan approaches, elderly immigrants are swamping clinics, community centers and pharmacies, unable to read the litany of Medicare-related mailings and or even ask questions about their new plans. "It's driving them nuts!" said Victor Law, owner of Alpha Pharmacy in Alhambra, who has spent countless hours helping many Chinese-speaking seniors. "Oftentimes they have a whole bunch of letters in their hand and we have to review them and explain to them what is going on." Some seniors who have lived and worked in the United States for years resent feeling excluded from a national program. The problem appears to be not just Medicare, the government health program for the elderly and the disabled, but many of the private plans that contract with it to provide services. "Medicare Part D is run by the taxes that I paid by working hard when I was younger," Lee said through a translator. The retired facilities manager for a Korean-language school, who has lived in the United States for 20 years, added: "I had a hope that the United States would deal with my case appropriately because I have paid my taxes appropriately." Although millions of beneficiaries have obtained prescriptions with no trouble, the program got off to a stumbling start in January after several hundred thousand patients ran into billing problems at the pharmacy counter. In many cases, pharmacists could not determine whether a person was covered. In others, patients were charged too much. Complaints about language barriers have arisen across the country, but the issue is particularly acute in California, where the primary language of one in five residents - and about the same fraction of low-income seniors - is not English, said Jeanne Finberg, a California-based attorney for the National Senior Citizens Law Center. "The federal government has really failed this population," Finberg said. "How outrageous is it that so many of the Medicare beneficiaries are unable to understand any part of this program?" Medicare officials said last week that they have been doing outreach at many senior centers, including those that serve non-English-speakers. In addition, they have helped fund nonprofit groups that offer toll-free call lines catering to those who speak Spanish, Chinese, Vietnamese and Korean. "We have room for improvement," said Anne Avery, health insurance specialist for Medicare. "We are just starting a lot more to find out what vehicles we can use to reach out to these people." Companies providing drug prescription plans under Medicare must accommodate non-English-speaking callers, said Peter Ashkenaz, a Medicare spokesman. And when calling Medicare directly, a beneficiary can request a translator through the toll-free line, (800) MEDICARE (633-4227). But the request generally needs to be made in English - which stops some immigrants cold. Except for an option to press two for Spanish, callers must listen to an English menu of options - with no hint of how to reach a Korean or other language operator. There's nothing to suggest that interpreters are available. Law, the Alhambra pharmacist, said he was baffled by why Medicare didn't directly set up language-specific phone lines. If that had been done, non-English-speaking beneficiaries "wouldn't be so frustrated," he said. For now, "they don't even know where to go for help." One day last week, several elderly women walked into the nonprofit Korean Resource Center in Los Angeles' Koreatown, each intent on getting help with her Medicare drug benefit. Most had simple questions. Amy Chin, 73, a retired dry-cleaning shop owner, wanted to confirm with her plan how much her medication would cost. The Koreatown resident was unable to do this on her own. "I tried," she said in Korean. "I waited a long time, but I can't do it." The resource center's goal is not to simply provide interpretation services, said health-access director Shannon Lee, but to help seniors learn to manage their drug plans independently. With a reporter and Korean center staffer listening in, Chin again called up her plan, Humana, hoping to reach an interpreter. She reviewed the advice provided to her in writing by the center: Continue pressing zero until you get to a live person. Then say, "Korean, please." Chin waited 15 minutes, hung up, called back and waited half an hour more before an interpreter came on the line, and that was only after the center volunteer intervened to make the request again. Kyong Lee's call was much shorter. The 65-year-old Downey resident, who wanted to get her drug prescription card number, reached a Unicare representative within minutes. "We cannot help you," the representative said, loudly and slowly. "Sadly, we do not have an interpreter's line .. Thank you for calling Unicare." Though the Korean center helped Lee to finally get answers to her questions, she was livid. "My heart was beating out of my chest out of frustration," she said in Korean. "I felt closed off. I felt disabled." She later signed up for a prescription drug plan through another company that offers better access to interpreters. A spokesman for WellPoint, the parent company of Unicare and Blue Cross, said the company's policy is to promptly provide interpreters when they are requested. "That's not the way it's supposed to work," said Robert Alaniz, a Thousand Oaks-based vice president of corporate communications, after hearing about the experiences of Lee Sun Hua and Kyong Lee. He said supervisors at call centers were reminded Friday of the policy, after The Times inquired. Alaniz said his company has interpreters for several languages on hand, and for other languages, operators can call on a live interpretation service. "We'd like to apologize," Alaniz said. "We're going to do anything we can to shore up those capabilities so people who do not speak English do not have to go through that experience again." The experience is typical of many plans, said the Korean center's Shannon Lee. Sometimes the operators "get fed up and say, can you at least speak a little English?" Lee said. "They don't want to go through the hassle of finding a translator." Sometimes even interpreters have difficulty translating Medicare concepts if they're unfamiliar with the program, said David Lipschutz, an attorney at California Health Advocates. For now, nonprofit groups such as the Korean Resource Center are trying to fill the gap. 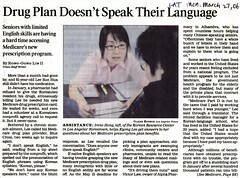 But some of the center's Korean-speaking seniors remain wary of Medicare and its plan providers. In Korean, Chin said: "It doesn't seem it's possible for me to call Medicare and the insurance company at home, by myself."